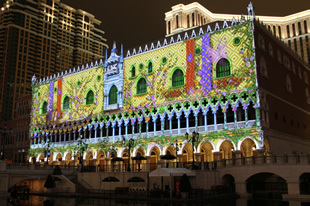 The Venetian® Macao-Resort-Hotel launched “Winter in Venice,” the biggest holiday festival in Macau. 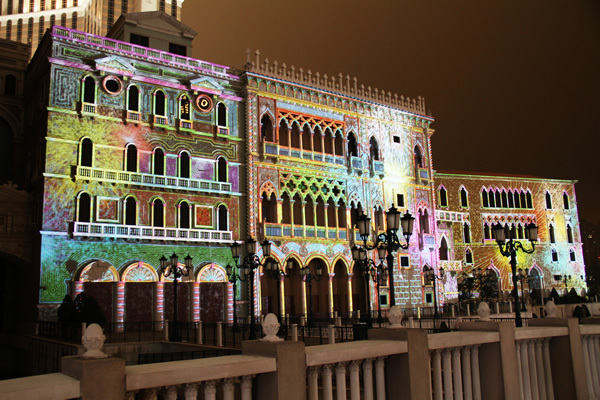 Supported by the Macau Government Tourist Office, The Venetian® Macao released a spectacular light and sound show, "The Magic of the Seasons," one of the world's largest architectural 3D projection mapping projects ever created. The dazzling light show, which was made possible by innovative digital projection mapping technology, took enthralled audiences on a great journey of the four seasons through stunning images and sound. The Italian-inspired holiday event, "Winter in Venice," first started at the world famous Venetian Resort in Las Vegas. It was the experience of a holiday wonderland, steeped in joy, wonderment and cheer. And in winter 2012, supported by the Macau Government Tourist Office (MGTO), this event was introduced to The Venetian® Macao-Resort-Hotel to offer a grand celebration of the winter season for people who visit Macau. Opened in 2007, The Venetian® Macao-Resort-Hotel is Macau's first integrated resort featuring stunning replicas of the famous canals and architectural icons of Venice, Italy. Backed by the unique architecture of the hotel, "Winter in Venice" provided audiences with over 500 spectacular shows throughout the festive season. A major highlight of "Winter in Venice" was a spectacular 3D light and sound show called "The Magic of the Seasons," hosted nightly at The Venetian® Macao lagoon, every 30 minutes from 6 pm to 10 pm. "The Magic of the Seasons" took audiences through a journey of the four seasons evoking the joy and wonder of summer, autumn, winter and spring through stunning imagery, an orchestral sound score and an array of special effects. From the golden glow of summer to the frozen icicles of winter, audiences were transported into a winter wonderland during the "Winter in Venice" event. 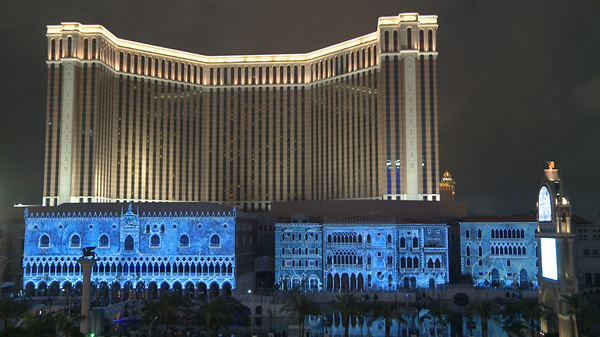 The unique architecture of The Venetian® Macao’s facade when amplified with light across the lagoon created a stunning vista for viewers to enjoy. 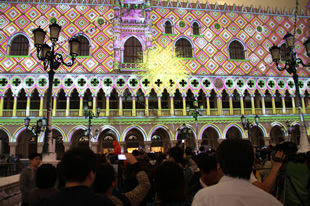 The "Winter in Venice" event was designed, produced and implemented by Laservision. Laservision is a world leader in entertainment communications, and known for their work in attractions, special events, architectural lighting, etc. It took over 12,000 production hours and 35 crew members from 6 countries to create this unique, customized sound and light show. A large number of high-brightness, high-resolution projectors were required to create this large-scale architectural 3D projection mapping show. As such, Laservision decided to utilize the Panasonic's latest technologies used for the Opening Ceremony of the 2012 London Olympic Games. A total of 26 PT-DZ21K 3-Chip DLP™ Projectors with 20,000 lumens of brightness were used. The PT-DZ21K Series of projectors are Panasonic’s flagship models for professionals, featuring breathtakingly beautiful images and reliable operation. mammoth dynamic piece of art. The stable, extended operation and high level of reliability achieved by the multi-lamp system and liquid cooling system were also key points in the performance's high evaluation. When "The Magic of the Seasons" 3D Light and Sound Spectacular started, the hotel’s facade was transformed into a magnificent masterpiece and audiences were given an unforgettable holiday experience. View more infomation about the PT-DZ21K. 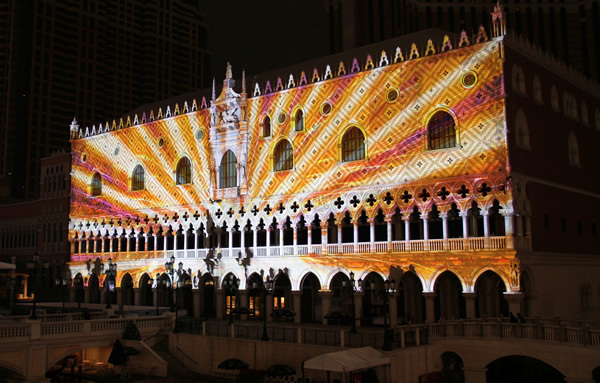 Note: The projection mapping and video images shown on this page are credited to Laservision - Designers and Creators of the Winter in Venice - "The Magic of the Seasons" Macau.